If you’re an aspiring artist, producer, DJ or professional, you should already know how important conferences, showcases and contests can be. If you don’t already know; then I’m telling you now; they’re important. I make it a point to attend several of these events, even if it doesn’t necessarily pertain to my profession, mainly because of the networking opportunities they present. If you know how to carry yourself and you have the necessary self-promo tools (business cards, CD, DVD, etc), events like these should not be missed. 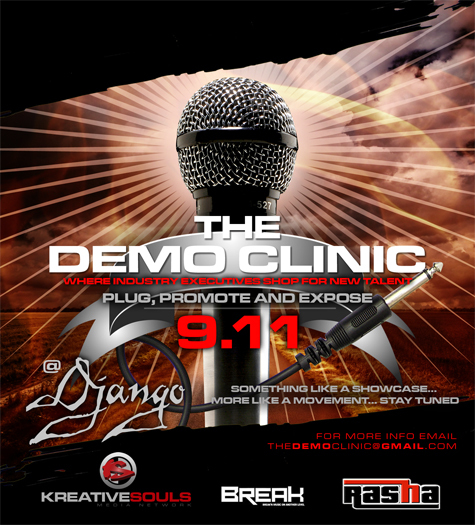 If you’re in Atlanta, or will be on September 11, 2008, make sure you attend The Demo Clinic being held at Django. For more information on this event, please check out the official page at http://rahiemshabazz.blogspot.com/2008/08/demo-clinic.html. Previous post: Blackberry Bold… Finally!